They were found at any given supermarket. The ubiquitous Funk & Wagnalls encyclopedia store displays. 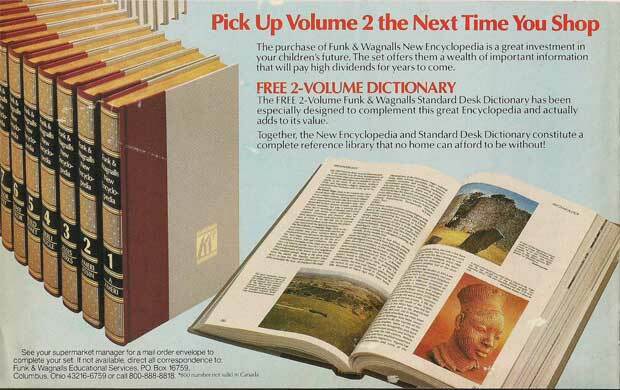 In the pre-internet age, the Funk & Wagnalls encyclopedia sets were fun to collect. And they lured you in with the first book, which sold for a penny or some ridiculously low price. But each week, you had to buy more volumes at the not-so-cheap regular prices to complete your set. Once you completed the collection and you just had to pick up the Y-Z book, you were often rewarded with a matching dictionary set or even a small veneer bookcase for your encyclopedia.